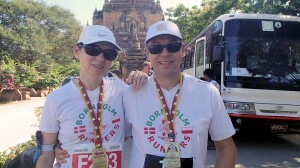 Greta ran her first Half Marathon and Jesper the full distance. It was a very hard run since the temperature came over 40 C and the surface of the run changed from mud, sand over in burning asfalt. Greta did her run in 3 hours 40 minutes and combined the run with taking a lot of pictures of the fantastic Bagan Temple area. Jesper had to fight through almost 6 hours before he finally could cross the finish line – no doubts this was the hardest marathon he has done until now. The extremely warm and smiling local people made the run possible. Beside this the atmosphere among the 145 runners from more than 20 countries were just great and a lot of new friendships made. To see the set of pictures please visit „Gallery”.